Two familiar topics were on many investors’ minds last week: trade and treasuries. Here is a recap of the key details and their market impacts. 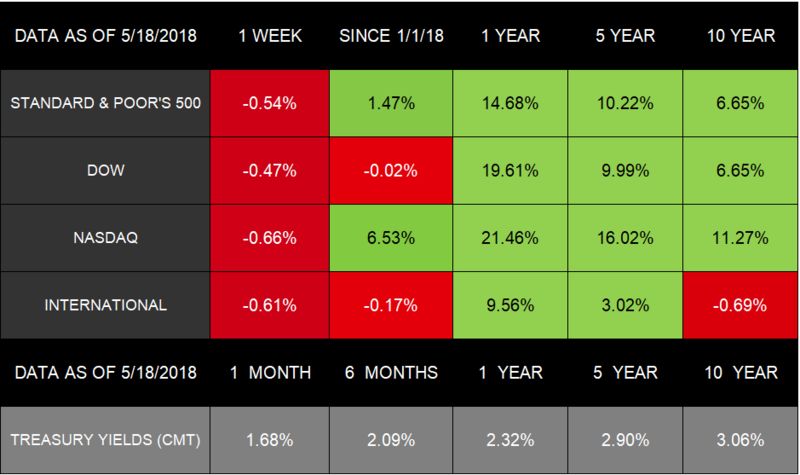 The 10-year Treasury yield closed at 3% or higher every day last week.10https://www.treasury.gov/resource-center/data-chart-center/interest-rates/Pages/TextView.aspx?data=yieldYear&year=2018 Early Friday, it reached its highest point in almost 7 years as data continued to demonstrate the labor market’s strength. We learned last week that the number of people receiving jobless benefits is at its lowest since 1973. Unemployment is also currently at an almost 17-year low. The numbers suggest the economy is likely reaching full employment. “Empty pockets never held anyone back. Microwave the milk in a small bowl until it is 100°-110°F (warm to the touch). Stir yeast and sugar into the bowl. Set it aside for about 5 minutes until it is frothy. Pour the mixture into a large bowl with an electric stand mixer. Mix eggs and beat gently by hand. Mix in butter and salt. It’s OK for lumps of butter to remain in the mix. Stir in lemon zest and half of the flour to form dough. Slowly pour in the rest of the flour. Use an electric mixer with a dough hook. Knead the mix on the lowest speed for 5 minutes. Dough will remain sticky. Put the mix in a lightly oiled large bowl. Cover the bowl with a damp towel. Set the mix aside at room temperature to allow it to double in size, 1-1½ hours, or overnight in the refrigerator. Turn dough on lightly floured work surface. Sprinkle flour on top. Roll and press until mix is ½-inch thick. Use floured 2½-inch round cutter to cut out dough and place on lightly oiled large baking sheet. Collect scraps and form a ball. Repeat the process of rolling and cutting. Cover with a damp towel and let rise until it is puffed, 30 minutes. At the same time, put a cooling rack over another baking sheet. Heat the oil in a large, deep saucepan to 350°F with deep-fry thermometer. 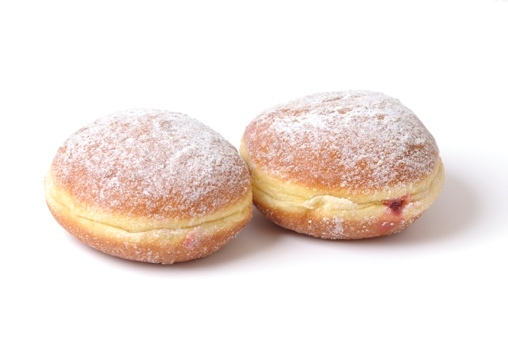 Carefully place 3-4 donuts at a time in hot oil, cooking until the donuts are golden brown, about 1 minute per side. Using a large, slotted spoon, move donuts to cooking rack to cool. Put donuts in a bowl with confectioners’ sugar to coat. Fill piping bag with jam. The bag should be fitted with ½-inch round tip. Cut a narrow slit in the donuts for filling with jelly. Fill donuts. Tax day 2018 has passed—and for American taxpayers, it was one of the last reminders of 2017. The IRS instructs filers to retain tax records and supporting documents for at least the 3 previous years. Taxpayers who used tax-filing software for the first time and who don’t have copies of their returns may order tax transcripts of previous-year returns from the IRS. The transcripts provide a summary of a tax return. Taxpayers seeking to obtain transcripts need to have the amount of their adjusted gross income to validate their identities. For more information, go to Validating Your Electronically Filed Tax Return. The IRS advises taxpayers to first check with the provider of the tax software they used or their tax preparer before contacting the agency for the information. The IRS charges a fee for providing prior-year returns. The transcripts, however, are free. It takes 5-10 days to get tax transcripts ordered online or by phone after the IRS receives the request. It takes about 30 days to get tax transcripts ordered by mail and about 75 days for tax returns. Go to Get Transcript on the agency’s website. Taxpayers may use Form 4506-T or Form 4506T-EZ to order by mail. Should I Slow Down My Swing Speed? It’s the beginner’s quandary: a powerful, lightning-fast swing will send the ball farther down the fairway and closer to the green, right? Probably not. While there are exceptions to the rule, those 100 mph swings usually send the ball to another fairway, to the rough, or dribbling 10 feet in front of the tee. Except maybe on a PGA Tour. While the notion is counterintuitive, those slow, focused swings generally produce the best results. Golf legend Jack Nicklaus creates a mental image of his hands and arms moving in slow motion during his swing. Instructor Butch Harmon says golfers will make better ball contact with controlled swings and a full shoulder turn. He adds that players should concentrate on restricting their speed to 75% of their capability. PGA winner Nick Price says golfers should focus on developing a fluid swing and completing their backswings. On the other side of the slow-swing school, golf legend Arnold Palmer said players shouldn’t apply the swing brakes too hard. How Can You Lower Your Risk of Falling? About a quarter of older adults fall every year, according to the U.S. Department of Health and Human Services. Falling sometimes leads to broken bones, limited mobility, and other health problems, especially for people 65 and older. Discuss with your doctor ways to prevent falling. Perform exercises that improve your balance and strengthen your legs. Get an eye exam every 1-2 years. Install safety features in your home, such as bathroom grab bars and stair railings. You think you’re safe from outdoor pollutants and toxins? Think again. In fact, according to the U.S. Environmental Protection Agency, indoors at your home is 2-5 times more polluted than outdoors. Taking a deep breath of fresh air outdoors just might make good health sense. But considering the fact that we spend on average 90% of our time indoors, it might be a good idea to find out what’s going on. Why is the air inside so much more polluted? Experts point to toxic household cleaners as one of the biggest culprits. Other household villains include new carpet, paint, mold, mildew, tobacco smoke, air freshener fragrances, personal care products, asbestos, pesticides, and certain pressed woods. What can you do to keep the air inside clean and healthy? Circulate: When possible, open your windows. Go natural: Try carpet made from wool or cotton rather than synthetic fibers. Buy cabinets made from solid wood with water-based varnishes. Don’t use air freshener: Spraying masks odors. Find and eliminate the source of bad smells. No smoking inside: Tell smokers to take their habits outside. It’s not impolite or unreasonable. Get plants: One good houseplant can clean 100 square feet of space. Pothos and spider plants are excellent at keeping your air fresh and oxygen heavy.